Whenever I record a listener questions podcast episode, I almost always have a couple questions regarding working from home. So I thought it would be a fun blog post topic since more and more people are beginning to work remote. I’ve been working from home for about 4 or 5 years now and I’ve really found a routine and a schedule that works for me. But if I don’t stay on top of that schedule, I’ll find myself off task and distracted. 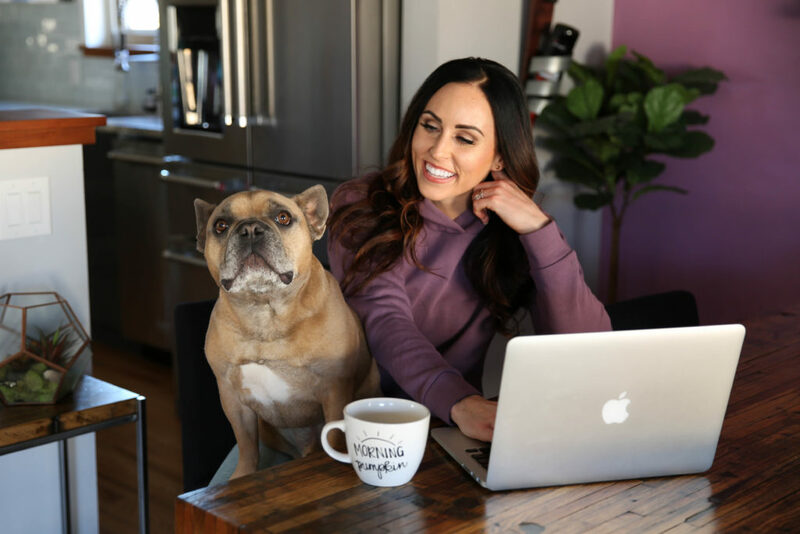 Today I’m breaking down the 5 “rules” that I follow to help keep me on task, motivated, and excited to wake up every single day! If no one is creating a schedule for you, you have to do it for yourself. Write down your to-do list for that day, create an hour-by-hour schedule and stick with it as much as possible. Creating a schedule for yourself should also means creating a routine. When you work from home, it’s easy to stay in your pajamas, not put on makeup, or even forget to brush your teeth. Believe me, it happens often. But creating this routine (such as coffee – shower – put on makeup – breakfast, etc.) for yourself will help prepare you for the day and keep you on task longer. It will also help you feel like you have your sh*t together. If you work best on your couch, awesome. If not, create a space that you feel comfortable and motivated in. That may be a home office, a stand-up desk, or just the kitchen table. Learn to change up your settings. I do this ALL.THE.TIME. I’ll start with working from home, then I’ll head to a coffee shop to work, then grab lunch, and then hit up another coffee shop before heading home to finish up a little more work. Breaking up the day this way really keeps me on task. This is a big one! If you know you are easily distracted by TV, don’t turn it on. If you know you are easily distracted by the laundry that needs to be folded, get out of the house and work from a coffee shop. 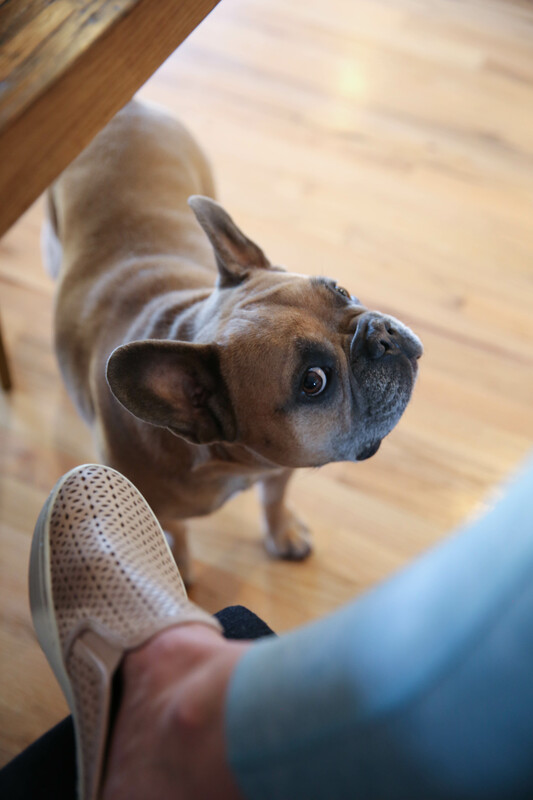 If you know your dog is going to be whimpering by the door while you have a conference call, get him to doggy daycare that day. Be aware of what distracts you and how to remove those interruptions moving forward. Whenever I write my schedule out, I also add in breaks to help me space out my day and keep me on task. I add in a break for lunch, a workout, walking the dog, appointments, etc. These help break up the day and help me feel like I’m part of a community and not just home alone. Cabin fever is real, people!! Depending on your job, this may be extremely hard. I think it’s honestly pretty hard for everyone since we are all so connected with our phones now, so I think everyone can relate to this. Decide what time your day will end and try to finish up everything before that time. For me, that is the time that my husband gets home from work, so I’ll work up until that time usually then I cut myself off. This works probably 85% of the time, but since I run my own business, it doesn’t always work out. I started setting a cut off time for myself about a year ago and it’s been really healthy for my marriage! The thing about working from home is that it’s all trial and error. And every day may be a little different. One day you may be extremely productive at home and other day you may need to go to 3 different coffee shops to stay on task. Just be aware that you may need to change it up – you may need to send your dog to doggy day care because he doesn’t want to leave your side, you may need to put on a full face of makeup to help you feel like a real human being, and you may need to learn to prioritize to help keep your work the best quality it can be. For me, no day is the same and I like it that way because I feel like I can be my most creative self. If I were to only sit on the couch every day and work on my computer from 9-5, I would never be as motivated or creative. Try to learn what is the best for you and be open to the fact that it will probably look different in a year from now. And before I let you go, I wanted to share a sample schedule of what my day may look like. This is my schedule for today that I wrote out in the Notes App (it’s so simple but it’s my favorite way to schedule my day since it’s easy to see in a pinch). Today I have a couple appointments, a couple coffee shops to work at, and a couple recipes to create. 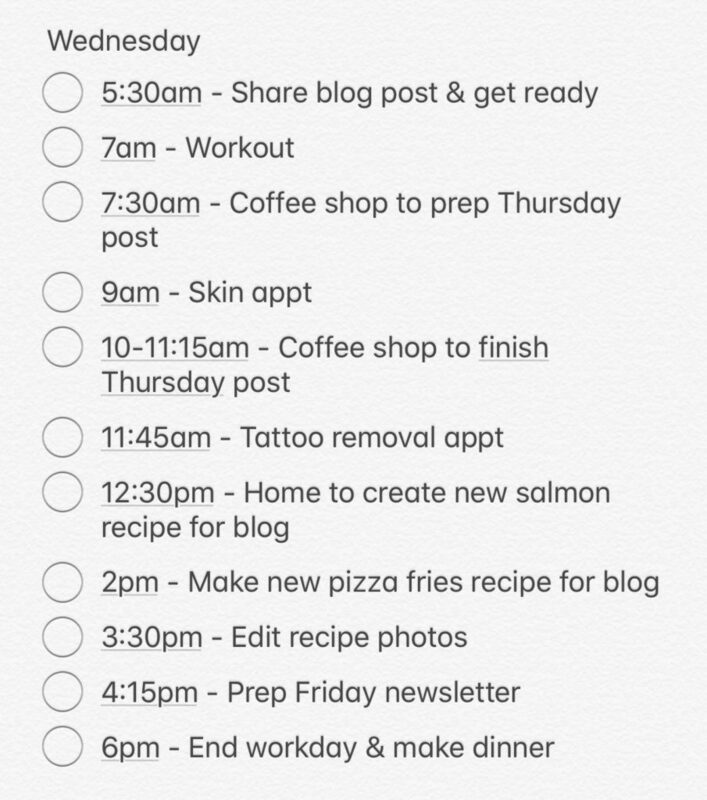 I like to write my schedule out hour-by-hour to make sure I don’t miss anything and so I can see exactly what I can fit in that day. I hope these tips and this schedule breakdown helps you figure out your own routine at home! If you’ve never worked from home, it can definitely feel a little odd at first. But if you start coming up with a daily game plan, you’ll soon be able to find a balance between work and home! I think it’s safe to say that Jackson is quite happy to have a mom who works from home. I had to send him to work with my husband yesterday so I could bust even more work out. He’s so damn cute…and distracting. The post How to Effectively Work From Home appeared first on PaleOMG – Paleo Recipes.